There’s still a month to go for the release of For Honor, but there are already concrete details about a season pass. In the Ubisoft store, graphics appeared, even if only for a short time. Before they were removed again, some users managed to take screenshots. Obviously, "Season Pass" owners get early access to six new warriors. The players without a season pass will have to wait one more week. In addition, you get early access to new content and there are three "scavenger crates", an emote, an emblem and 30 days the champion status. 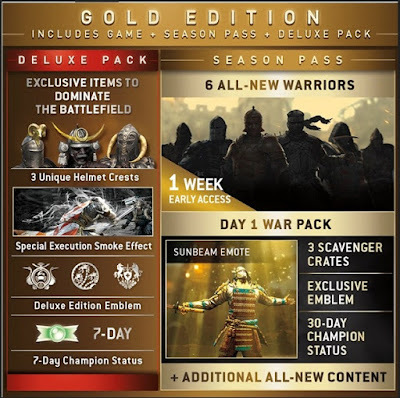 The cost of the season pass is not yet known. 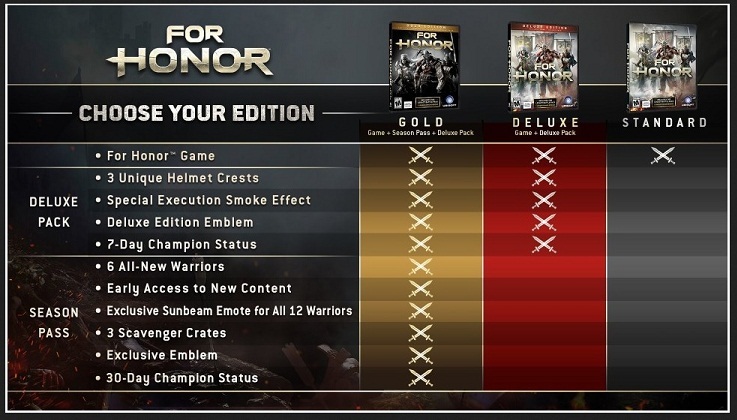 The graphics show that the new heroes and other content, such as maps or weapons, will not be exclusive to season pass owners. They receive the content earlier. Say, if you want to spend extra money, your future gameplay content will get faster and with less effort. Just a few weeks ago, we reported that Ubisoft did not want to split the "For Honor" community. Any player who purchases the main game should receive all future gameplay content at no additional cost. Only cosmetic items will only be available with real money.